> You can also book online on our website . > Mandatory to confirm your presence by 5.30pm. > All registrations CLOSE at 5.45 pm. No refunds. > For ages 5 and above. > Suggested outfit – Casuals. For any queries, you can call us on 98252-53171. 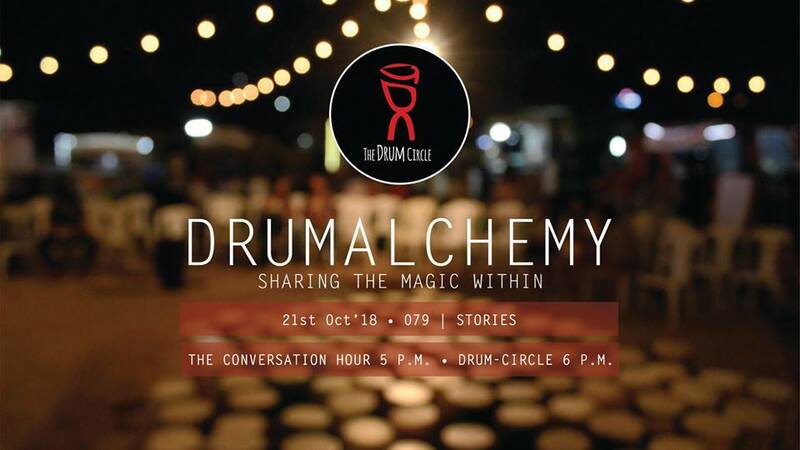 DRUMALCHEMY – SHARING THE MAGIC WITHIN. ‘Alchemy’ means, a seemingly magical process of transformation, creation, or combination. Intent for Drumalchemy – To drum, create and feel the magic within and sharing it with the community. Before we all begin to drum, it’ll be great to brew some conversations. This little hour is about coming together and involving ourselves into a dialogue (since you’ll have good time after registrations) with the space and the beautiful people that walk-in, to set our frequencies for community creation. We had been longing for Drumalchemy to happen and seeing it finally manifest is quite an ALCHEMY in itself.